One of many blissful bales across the property. Balinese holidays seem synonymous with affordable luxury resorts. But here, Alissa Jenkins discovers that Pan Pacific Nirwana Bali is much more than just another lavish stay. Looking out from a thatch-rooved bale, the Bali Sea rolls and retreats, frangipani lingers in the air and an apple mojito is delivered as I towel off after a dip in a nearby swimming pool. To most, this is what holiday dreams are made of. You’ll find such a heavenly setting at Pan Pacific Nirwama Bali in Tabanan, about 20 kilometres north-west of Seminyak – a well-known haunt for travelling foodies, shoppers and spa-goers alike. Yes, it’s another Balinese resort. And yes, it comes with the usual resort trimmings – buffet breakfasts, day spa and uber-comfortable rooms. However, this is not JUST another Balinese resort. There’s something else here that sets Nirwana apart from most. The location, for instance, set atop a sheer cliff with oceanfront views, takes in a whopping 103 hectares. It’s this wide open expanse of frangipani trees, rice paddy fields and an award-winning 18-hole golf course (designed by none other than Mr Greg Norman), that immediately deflates any preconceived notions of “resorstrophobia”. That is, resort-claustrophia – where there’s just too many guests in too small a space. You know the feeling – where it’s like you’re eternally in a queue, a crowded elevator, or an overpopulated pool. But no, Nirwana has space, and it has it in spades. Dotted throughout this vast patch of paradise are 19 temples, among most impressively is the Tanah Lot Temple. Perched on a large rock just offshore, Tanah Lot is said to date back to 15th Century, and has become an integral part of local Balinese mythology and Hindu culture. To get there from the resort is a scenic little stroll across the grassy headland, past souvenir markets and down a path onto the surrounding beach. But the Nirwana difference doesn’t end there. Just beyond the resort boundary is a Turtle Conservation and Education Centre, which works closely with the property to form a hatchling program. Yes, that’s right, an impossibly-cute-baby-turtles program. To help promote the survival rate of endangered sea turtle populations here, a number of hatchlings from the conservation centre are regularly re-housed at the resort’s onsite Kids Club, where tiny travellers are taught about looking after the ocean and sealife. Then after a few weeks when the turtles are a little bigger, a little stronger, and no doubt a little cuter, guests are invited to join the weekly hatchling release where they’re blessed by a local priest before being sent off into the sea. A word of warning – there is nothing more adorable then watching these little guys flap their way to the waves then torpedo towards the horizon. So if you’re not one for overt gushing, best stay by the poolside…or the spa….or the golf course. Speaking of, even Nirwana’s “usual” features are a far cry from the typical resort standard. A run-of-the-mill buffet breakfast for instance, is in fact a stomach-stretching foodie extravaganza with a side of ocean views, while udeng-wearing musicians gently tinker a Balinese xylophone in the background. Resort cooking classes may not be a revolutionary new experience but here they centre around fully-equipped outdoor cooking stations, resembling something from a high-budget cooking show. And the likely resort pool is nothing short of a four-tiered masterpiece; incorporating jacuzzis, waterfalls, a 54-metre waterslide, bars, and countless sunbeds. Yes, this is far from just another Bali resort, but rather a destination in itself. And this seaside bale is one destination I don’t plan to leave anytime soon. 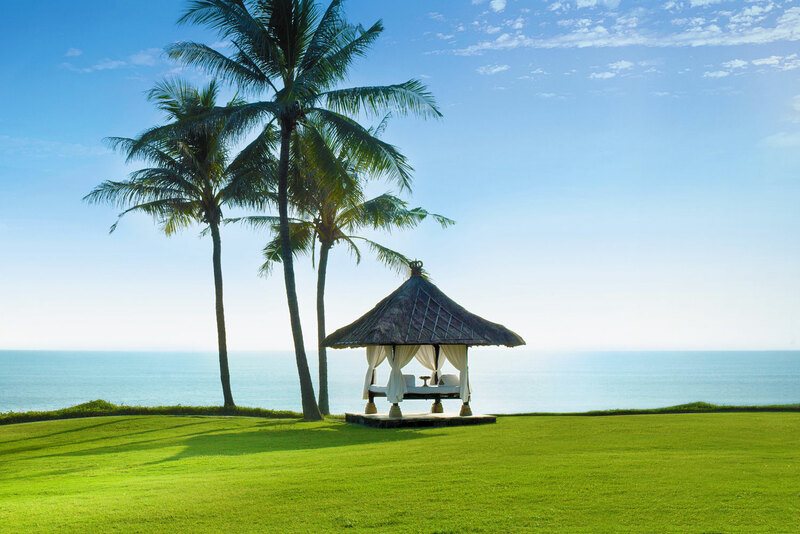 In the heart of Bali’s southwest coast, the resort is about a 55-minute drive from Denpasar International Airport. Additional activities available at Nirwana go far beyond the pool and golf course. There’s also a paintball and ropes course for guests to use, as well as rice planting experiences, an indulgent day spa, turtle hatchling releases, Indonesian cooking classes, private beachfront dinners, outdoor yoga plus much more. I’ve just been to Heaven, so I will have to go on a return journey to the most fabulous Pan Pacific Nirwana Bali resort,(namely Heaven) when I do die, just in case I managed to miss some of the wonderful experience’s they arrange for you. The staff where trained by “God himself” so calm, so caring.Ivan the GM,& the manager John Travoltas double,(wonder if he can dance? )Above all Jeremy Baker from Sydney who arranged this trip of a life-time. I’ll never forget you all.Many,many thanks. Dot Heuff Paula & Macy-Rose Howick, South Africa. Can you believe that we could actually afford to shop.? ?